In The New Vision for the New Architecture author and art historian Jaroslav Andel presents the significant body of architectural photography produced in Czechoslovakia in the 1920s and 1930s. In this period, both architects and photographers saw themselves as participants in the creation of a new world, pursuing beliefs in social and technological utopias. Practitioners in the two fields shared and stimulated each other’s vision, fostering interplay that consisted of mutual influences, parallels, and affinities. This relationship was highly developed in Czechoslovakia where special conditions existed for the reception of the modern movement in both architecture and photography. The process of modernization as well as the creation of nation states and the rise of the middle class started later in Central Europe than in Western Europe. With its young middle class, the new Czechoslovak state eagerly embraced modern ideas and recognized in architecture a powerful tool for expressing its goals and ideals. 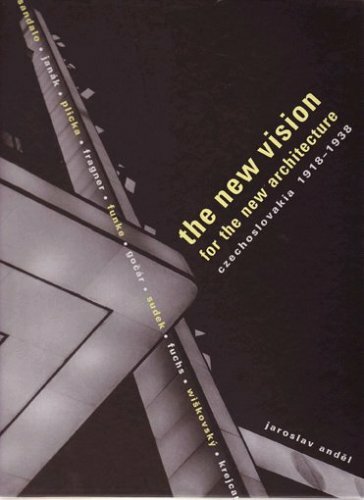 Featuring photographs made in collaboration between avant-garde architects and photographers, the images depict key modern buildings, as well as lesser-known ones and are organized according to building typology and referential design (aviation, cinema)—an organizational concept first used in the exhibition “In Praise of the New Architecture” (Prague, 1940)—communicating the original vision that continues to inspire today. They also demonstrate that interwar Czechoslovakia was a leading European influence in the modern movement of architecture and photography.